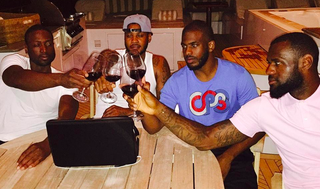 Here is a photo, taken from Dwyane Wade’s Instagram, of Wade, Carmelo Anthony, Chris Paul, and LeBron James drinking some fine wine together in the Bahamas. My two questions: would you wear a t-shirt with your own nickname on it, and is Carmelo a bit faded? So what do four cool married guys in their early thirties do in the Bahamas for fun? Apparently, after ditching the lame friend—Carmelo probably needed to sleep in—they take a ride on a hilarious looking contraption. NBA stars, they’re just like us! Just 3 Guys On a Banana Boat. There has never been a more perfect headline in the history of journalism.